Welcome to the Month of Will 171! In this issue we look at the topic of money. Please click on the title of the articles you wish to read. To him who believes in God and the Last Day, and for those who fear God, He prepares a way out. And He provides for him from sources he never could imagine. And any one who puts his trust in God, sufficient is God for him. For God will surely accomplish His purpose. Verily for all things has God apportioned a due proportion. 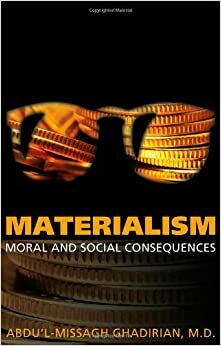 This month’s book selection is: Materialism: Moral and Social Consequences by Dr. Abdu’l-Missagh Ghadirian, a Canadian Baha’i psychiatrist, who traces how the philosophy of materialism has infected our global culture and led to numerous problems, from environmental degradation to poverty and human trafficking. By ignoring the importance of a spiritual dimension of human existence, humanity will forever be chasing the chimera of unceasing acquisition, unable to find true contentment and well-being. Drawing on Baha’i scripture, Dr. Ghadirian, offers us a road map away from materialism and its excesses. This month we feature the music of Bahareh Khademi, a singer with a voice like an angel. She is a classically trained soprano and songwriter who has also performed in a wide variety of plays, musicals and operas. Her concerts have benefitted the Australian Children’s Music Foundation and helped the homeless in Australia. Recently, her Kickstarter project was successfully funded, which will enable her to produce her first CD ‘Immerse Yourselves’; beautiful and uplifting devotional music containing five songs she wrote herself. Although they are based on the Writings of the Baha’i Faith, they transcend religion; and focus on themes we all ask ourselves, that drive us home and lead us to peace. Once the CD is done, she plans to travel around the world to share her spiritual journey with communities. Don’t hesitate to contact her, if you think you’d like to host her in your community! · looking for a lasting sense of real fulfillment from their work. If this is you, give her a call! Barry Lewis Green is The Unity Guy™ and the heart and soul of EPIC Engage™. He is a teacher; speaker, facilitator, trainer, educator, coach and consultant. With EPIC, he helps companies, campuses, conferences and all communities to move forward together in thought, will and action. He has spent the last 30 years developing leaders and advancing cultures of energy, excellence and innovation. Barry is a global voice for character, culture and diversity as strategic advantage. He has delivered on leadership and business management programs to tens of thousands of youth and adults across North America. His expertise is community building and business development with emphasis on strategic leadership, organizational behaviour, and entrepreneurship. He has a breadth and depth of experience in the private, public and not-for-profit sectors. He speaks your language. Barry’s content is rich. His delivery is real. His passion is undeniable and infectious. No matter the diversity of perspectives, he brings groups together, engaging hearts and minds in tandem. Thanks everyone for your kind words and encouragement! It keeps me going!